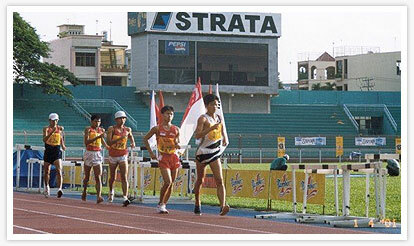 Edmund Sim has been a mainstay in the local race walking event since the late 90’s. Introduced to the sport at a tender age of 13-years-old by chance, the now young executive is still training hard, pushing up to 12 training sessions a week despite holding a full-time job. Find out from the interview below, as Edmund shares his passion for racewalking, and what makes him tick. I am currently working in the public sector as a SAP executive. How did you get started in walks? I started off as cross-country runner back in secondary school. The following year, I signed up for the walk. With no prior experience in the event, I struggled and I was lucky to be able to win the race, missing out on the school record by one second. After a gruelling year of transformation, I broke my school’s walk record and won my first national medal at the National Junior Championships in 1999. Making the switch was the best decision I ever made and I owe it to my PE teachers from Whitley in particularly Mr Foo Chee Kai who introduced me to the event and constantly encouraging me to push myself further. Tell us of your own sacrifices for your passion. As a student athlete, life was pretty mundane – just studying and training. Social outings were limited. I had to reject most of my friends’ invitations to outings due to trainings and competitions. It came a point where people felt that I was aloof. As a result, some of them stopped contacting me because they assumed that I wasn’t interested to be a friend. Juggling between studies and sports was tough. At times, I wondered if everything that I had gone through was worthwhile. Nevertheless, I sailed the boat through multiple storms and it built a more resilient character in me. If I wasn’t in sports, I might be spending time doing other ‘time wasting’ activities anyway. During my university days, I had to juggle between a full time job, a part time degree course and sports. I couldn’t afford to study and train full time because I needed to support my family after my dad passed away in 2005. Having a hectic schedule left some gaps in my life. If it was not for UniSim, I would not have made it to the 2007 World University Games and know great people (in school) who have made an impact in my life. In 2005, I also thought of quitting for good and it was not really due to my personal crisis. A large part of me felt that I could no longer contribute to the sport. So I stopped training for 1.5 years. As time passes, I felt something missing in my life. Thus, I started training again in 2007. Sourcing for equipment is another challenge and that’s on top of my limited budget for track. Each year, I wear out at least 5 pairs of shoes and the bill for shoes alone comes out to be at least $1000. Mind you, $1000 is not a small sum even for working adults let alone a student. Furthermore, I am never sponsored for equipments and it can be a challenge to buy shoes from shops because they often run out of sizes for my feet. As a result, I may have to race in torn shoes and they can be pretty nasty. For the same reason, I walked my first international race (20km) with a big hole at the bottom of my shoes and it gave me a big blister after the race. To fund my interest as a student, I had to scrimp and save whatever I could. I could not bear to ask from my parents because the household had its needs too. I was also thankful that my tutors from Ngee Ann got me a sports scholarship from SSC which lightened my burden on training expenses. Of course, being in a unique event also requires me to cultivate a level of patience. I have been insulted while training on the street, discriminated and I even had a senior sports administrator throwing me out of the track in the middle of a workout because he needed the entire place for relay training. To make matter worse, the track was even not booked for exclusive usage. Walks will be introduced next year in National Schools. What are your thoughts on that? Finally! There are a lot of local athletes who will make good racewalkers. Unfortunately, the lack of local event turns people away from it. Like I have mentioned earlier, I started walking as a school boy. Back then, I had limited events and walking was absent from the school scene. So having the event featured in the National Schools meet is a stepping stone to a brighter future for racewalking. I look forward to see the next generation of champions. What can be done to improve the state of local walks? We need to educate the public on racewalking. As the quote says, walking is the most fundamental action that we have to learn before we can run. People are shunning it because they feel that racewalking is just a faster mean to get from point A to point B and they will not be able to get a good workout out of it. Secondly, we need more events. Every month, I see at least 5-6 running events and walking is often categorised as a fun event. In the past, we had the Newpaper Big Walk which was the premiere racewalking event in South East Asia. After the big walk was cancelled, many walkers left the scene because there were no more major events to look forward to. Lastly, racewalkers should be given equal opportunity to qualify for major games. The athletics fraternity is like a battalion of soldiers, each with their own unique capabilities. While racewalking may be a low ranking trooper, undermining the existence of it will cripple the entire battalion in a war. How often do you train. I trained 12 times a week when I was a full time student. I would wake up at 5:30am to run 10-12km, returned home by 7am to get ready for school and back to the track again for another session in the evening. A blast from the past. Edmund in second place back in 2004 for Vietnam Open. Nowadays, I train 7 times a week and the sessions are usually held after work. I cannot afford to train in the morning because of my work schedule and I train after midnight at times. Is there anyone coaching you? Or you’re on your own. I am currently on my own. Walking being a technical event, it will be good to have a coach to guide me during training. Unfortunately, my current schedule does not allow me to do so. Therefore, I have to rely on the training principle that my coaches taught me. Yes, ‘principle’ in singular form. All these years, I was neither taught to race smart nor showed anything on race tactics. The only piece of advice that I had was “Train Hard and Race hard.” No 70% or 80% effort during training, just simply “walk through the pain.” Basically, it was training to be Steve Prefontaine with the heart of a Kamikaze pilot. Although I have gadgets for training, they are merely used for post training analysis and not meant to keep me on a pre-defined effort. However, I can’t do everything with technology and feedbacks are still essential in training. Since I am very much on my own now, I rely on reflections from billboards, bus doors, cars and shadows. It may sound stupid but it is the next best thing to camcorders. I am also lucky to meet nice people like our national racewalking coaches and senior athletes who constantly give me feedback on my performance from races. Share with us a peek into your workouts. My training is pretty simple and I place heavy emphasis on walking techniques. For long walks, I cover up to 30km. On hard days, I work on shorter distances (such as 200m repeats) for speed and mid distances (such as 1000m repeats) for speed endurance. I also do weights training, walking drills and aqua training for strength and conditioning. How about nutrition and supplements. I hurt my knees after completing a marathon in 1998. So I take glucosamine for it. Other than that, I do not have a specific dietary regime. I firmly believe in working and playing hard. Nothing beats having a good meal after a hard day at work. On my food intake before a race, I shall not reveal because we have under-aged readers. Athletes and managers who have been overseas with me will know. Where is your training ground by the way? I usually go to Ngee Ann Polytechnic for track training while road trainings are conducted at a number of places namely; ECP, Sengkang Park and Bishan Park. 1. To improve on my base speed. 2. To walk the Standard Chartered Marathon under 4hr15min. 3. To better my PB for the 10km walk. Your long-term goals and objectives? My long term goal is to break the national walk records and compete in major competitions such as the SEA Games. Are you any closer to qualification for SEA Games 2011 in Indonesia? Unfortunately, I am not. Nevertheless, I will keep trying and I hope that SAA will give me the opportunity to qualify next year. What is your source of motivation when you face challenges in your sports? The desire to walk faster and to scale new heights. One of my long term goals is to break the national walk records and participate in major international competitions such as the SEA games. However, it is a challenge to get a qualification race with the recognition that my sport is given. The closest I came to qualifying was in 2005. Unfortunately, I was disqualified while leading in the 20km race. When I returned the following week, my coach made me redo the distance and I did 1hr40min for it. I tried to ask for another trial but I never got it because officials from the Singapore Athletics Association (SAA) felt that I had embarrassed them. Come on, even world champions get disqualified. It is part and parcel of sports. To make matter worse, the bronze medallist at the Sea games that year did 1hr42min and I was sitting at home wondering if I had been robbed. I was away from the athletics scene between Sept 2005 – Dec 2006 to administer my family affairs after my dad passed away. I contemplated quitting for good but I felt that something was missing. So I made the decision to start training again in 2007 despite having to balance work, studies and training. Life was busier but definitely more fruitful. I may or may not succeed with that kind of schedule but I would never know if I didn’t try. The bad episode in 2005 was carried over to 2007. At that time, the World University Games was to be organised in Thailand. As the event is second to the Olympics, the competition standard is world class and will definitely push an athlete to the limit. However, SAA was not interested in giving me the opportunity because of the disqualification result in 2005 and I wasn’t pre-selected for the 2007 SEA Games. Therefore, SAA refused to give me any subsidy which was enjoyed by my counterparts from NTU, NUS and SMU. I was fortunate that SIM stepped in and sponsored my trip there. Unfortunately, I still failed to meet the Sea Games qualifying mark in that meet. Nevertheless, it taught me a lesson on opportunity – seize it when it comes. Perseverance is triggered by our dreams and desires. As we speak, I am still training and hoping to qualify for the next Sea Games.